This magnetic supreme led road flares emits 360°ultra-bright light from an array of 16 LEDs, visible for up to1.2 miles (2Km) away. This magnetic supreme led traffic flares emits 360°ultra-bright light from an array of 16 LEDs, visible for up to1.2 miles (2Km) away. It is waterproof and crushproof. You can run it over with 10,000 pounds vehicles. Unlike flashlightswith alkaline batteries or chemical light sticks, Safety light units can handle extreme temperatures and extreme situations (intrinsically safe), and featurean impressive 2 years storage/shelf life, using lithium batteries that won'tever leak. This same technology used by first responders and the military is now available for you and your family. This safety light is ideal for breakdown & emergency roadside situations. The supreme led traffic flares is 9 different flashing patterns, including SOS Rescue (Morse Code) and with powerful magnet to attach to metal surfaces. Its cases comes with red, yellow, blue, amber/orange, green, white and black. Complies with U.S. DOT (FMCSA) 49 CFR E 392.25 & 393.95(g). Housing made of PC, TPE and TPR, it is even no problem allowed a car drive over it!. Completely waterproof! It even floats! Perfect for boats and watercraft safety, also it is no problem working underwater 1/2mile. Charging time: battery can be fully charged within 12-13hours. 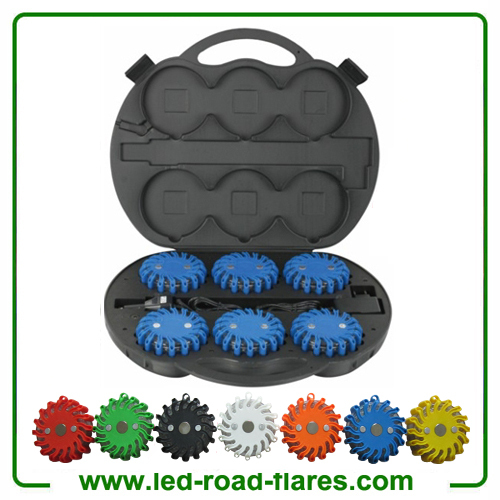 supreme led traffic flares is used to Identify road hazards, signal for help, mark detours,underwater scuba or repair applications. Ideal for emergency responders road safety identification by emergency responders and personal vehicle operators.May also be used on construction sites, for aviation marshaling and taxiing, event management, in marine applications for boater emergency safety or scuba.